I’m the first to say that I’m a noob when it comes to Dungeons & Dragons. I have only participated in one one-shot campaign, which allowed me to create Mr. Waffles the ultimate cat/lion killing machine. But I’m always looking for new opportunities to participate in a another one-shot or play D&D weekly, so I’ve put together this guide of local meetups for anyone else who’s trying to find the perfect role-playing group. Before I get into the Twin Cities D&D meetups, I’d like to suggest a couple podcasts about D&D for beginners. Both allow you to listen to an active campaign and get introduced to the mechanics of dice and paper RPGs. How We Roll is a podcast about a couple British and Irish players recording their sessions with Call of Cthulhu seventh edition and Dungeons & Dragons fifth edition. Besides listening to their lovely accents, it’s a great way to introduce yourself to different rules and settings. I personally find the Call of Cthulhu episodes to be more entertaining, but then again Cthulhu is probably one of my favorite mythical creatures. Meanwhile, She’s a Super Geek is the perfect podcast if you label yourself as female because these ladies rock. In addition to showcasing female GMing, they promote role-playing games created by women. Ladies looking to get introduced to role-playing would find this podcast to be useful. But however great these podcasts may be, the only way to get more introduced to the world of D&D is to play the game! Here are a few meetup options to find your gaming group. Ultra Old School is a Facebook group hosted by local geek Matthew Seaton, who tries to bring like-minded D&D players together for sessions at various game stores in the Twin Cities. (This is how I participated in that one-shot campaign I mentioned above.) He also is trying to get some gamers together for a Star Wars: Edge of the Empire campaign, so now would be the perfect time to join his group. Fantasy Flight in Roseville sponsors D&D every Tuesday night using fifth-edition rules. Newbies are welcome: all you need to bring is yourself, and onsite game masters will walk you through how to create your character. Shieldmaiden Sundays at the Source are a safe place for anyone who identifies as female to meet other women and participate in D&D or other geeky activities. Specifically, D&D starts at noon each week, and there are plenty of veteran players willing to assist anyone who (like me) lacks experience in creating a character. Level Up Games in South St. Paul runs D&D every Wednesday starting at 6:00 p.m. There the store also endorses a Facebook group for Twin Cities folks in the southern area of Minnesota looking to find a gaming group, which anyone in south St. Paul, Burnsville, Eagan, Bloomington, Apple Valley, or Eden Prairie might find useful. 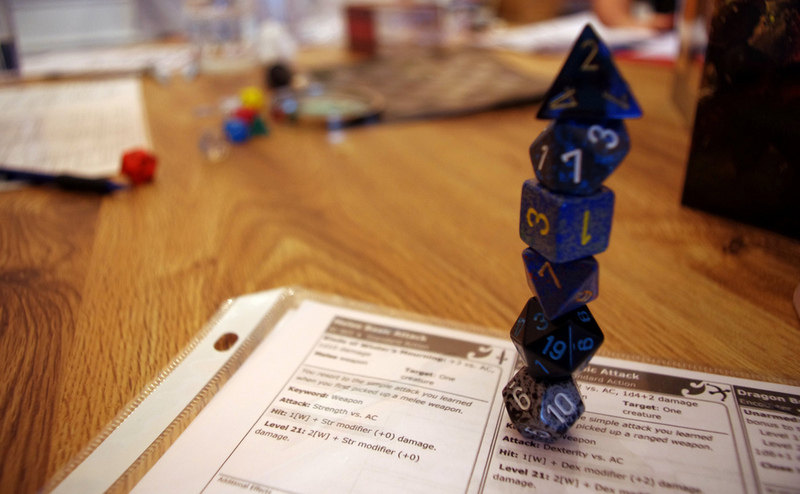 The Twin Cities Roleplaying Association Meetup group has over 1,400 members, with plenty of upcoming events to get you started with your dice-rolling adventure. If the days the other groups on this list meet aren’t great for you, this one might have schedules that would work better. I hope everyone finds this helpful in locating games to play. It’s not exhaustive, so let us know in the comments if you want to suggest any other meetups! I used to be intimidated to play D&D because none of my friends play, and my boyfriend has no interest in getting started. However, as I find players to game with, it makes the mechanics of the system less challenging to learn. Who knows—maybe I’ll start my own campaign and become the ultimate game master. If I start a campaign any time soon, Twin Cities Geek will be the first to know. I have just moved to Minneapolis and I am really hoping to find some gamers who would like to play some old school 1st edition AD&D or Marvel Superheroes. I hope they are out there. We have over 9,000 geeky members, and one of them may be looking for someone for their game! I’m leading a swashbuckling pathfinder D&D game in St Paul, on the river, and have some seats available.